The Sustainable Development Goals (SDGs) are 17 Goals to Transform Our World by 2030. Adopted by world leaders in September 2015 and implemented at the start of 2016, more than 150 countries have pledged to mobilize efforts to end all forms of poverty, fight inequalities, and tackle climate change, while ensuring that no one is left behind. The SDGs build on the work of the Millennium Development Goals (MDGs) that were emphasized from 2000 to 2015. The new SDGs are unique in that they’re broader in their scope of eradicating all forms of poverty by calling for action by all countries, rich and poor, to promote prosperity while protecting the planet. OHorizons’ BioSand Water Filter in a Bangladeshi Family’s Home. OHorizons’ primary focus is on SDG6: Ensure Access to Water and Sanitation for All, however we are aware that these Goals are an interconnected web of opportunities that must be creatively approached through a systems perspective. Our organization was founded with the mission of ending hunger on a global scale SDG2: End Hunger, Achieve Food Security and Improve Nutrition and Promote Sustainable Agriculture.The main reason we got involved with water projects was because many illnesses associated with drinking contaminated water can lead to undernourishment, chronic malnutrition, and even death. Our work providing clean drinking water access to families also easily connects with SDG8: Promote Inclusive and Sustainable Economic Growth, Employment, and Decent Work for Alland SDG5: Achieve Gender Equality and Empower All Women and Girls. We wrote a whole blog post on these connections for World Water Day 2016. A transition to a world that doesn’t include hunger, poverty, and insufficient safe drinking water access will require innovative thinking and solutions that transcend traditional siloed boundaries. The Sustainable Development Goals are not legally binding, so it's up to us, the citizen changemakers of the world, to carry them out on the ground as well as to hold our countries' leaders accountable to following through on their commitment. Below we’ve laid out some ways you can make your voice heard and contribute to the Global Goals agenda. Talk with your family and friends. Word of mouth insight from the people you trust is essential to every movement. Ask them if they’ve heard of the Global Goals for 2030 and/or seen the periodic table of Sustainable Development. Let them know which goals are most important to you, why they’re important, and how people and organizations around the world are working to address them. Share content and ideas on social media. Share this blog post using the hashtags #GlobalGoals #SDGs and #SDG6. Visit http://www.globalgoals.org/tell-everyone/ to find official campaign images, facts, and photos to share on social media. You can also write your own social media post, blog, editorial to a newspaper, etc. to share your insight into the importance of all of the goals or a specific cause. Write business leaders and your elected officials asking them to educate themselves on the Global Goals and to incorporate them into their agenda. 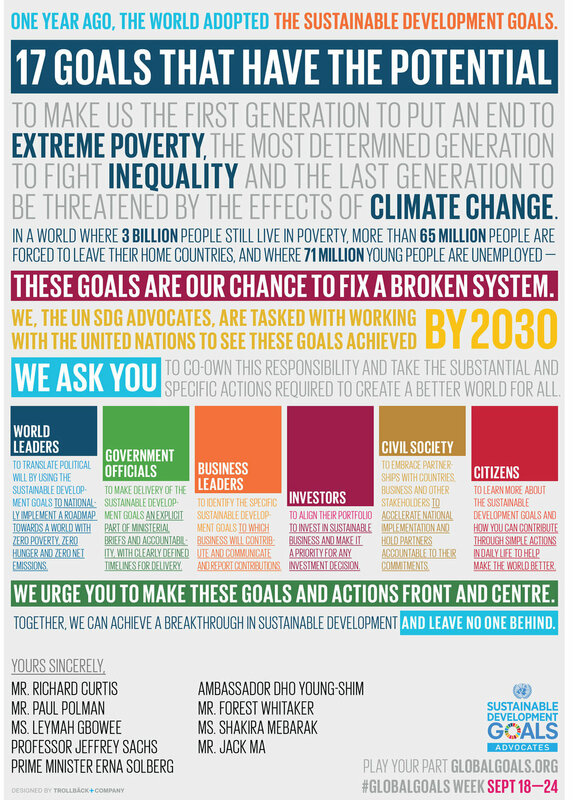 Within your letter or email include the UN SDG Advocates open letter. (Download here) It is a beautifully designed call to action for all sectors to play their part in achieving the goals. Volunteer with organizations working on the SDGs. You have the power to directly contribute! If you look for volunteer opportunities, you’ll find worthy organizations that need your help. OHorizons' has utilized skilled volunteers around the world to help strengthen every aspect of our organization!